This Wednesday the Pretty Little Liars mid season finale will air on Netflix, and after 6 seasons we will finally find out EVERYTHING. EVERYTHIIIIING. Maybe. Apparently. So we're told. I actually only started watching the show a few months ago. I binged the first 5 seasons in quick succession after becoming immediately obsessed. By the time season 6 started airing I was still halfway through season 5 which meant I didn't have that agonising wait after the S5 finale to find out what the F was going on with that dollhouse. Lucky me! I caught up around episode 4 of S6 though so had to join the rest of you and actually WAIT a week for each new episode. The wait this last week has been so annoying after that (predictable) cliffhanger. 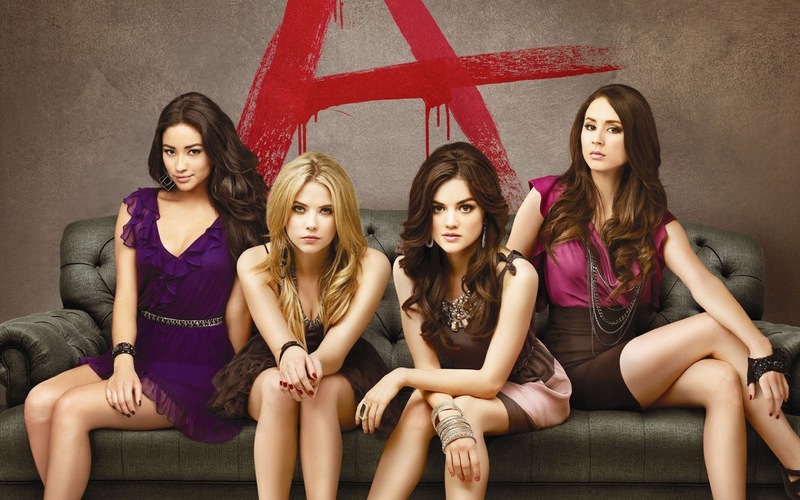 We're sooooo close to finding out who A is and I'm way more excited than a 30 year old woman should be about what is essentially a young adult drama. Ahead of the much anticipated episode 10 I thought I'd share some of my thoughts on what I think is going to happen. It goes without saying that here be spoilers past the jump! So in episode 9 our girls have been banned from attending their own prom, so end up hosting their own mini pity party prom in Spencers' barn. Predictably though they do end up going to the prom after all - chasing after Ali who has received a text from Charles telling her to go to the school if she wants to meet him. At the school after going on a bit of a wild goose chase Ali is eventually snatched by Charles and the episode ends with that not entirely unexpected moment where Charles/A removes the hood in front of Ali who exclaims "oh my god!" before we cut. Gaaaaahd you big tease! One of the things I really enjoyed in this episode was the drunk mums snooping around the De Laurentis house looking for clues and subsequently getting locked in the basement. I love all of the mums and it was fun seeing them interact with each other and going on the trail of Charles a la their daughters. The drunken mum detectives storyline brings us neatly onto Rhys, the latest A/Charles suspect who we were introduced to in a recent episode. Now I am not a fan of red herring characters like this who are brought in as new A suspects only to then be explained away a few episodes later (e.g. Leslie), so I'm not really enjoying all of the "Rhys is Charles!" chat. I am 100% convinced that Rhys is NOT Charles, and here's why. The main thing everyone has been focusing on is the fact that Rhys looks exactly like Jason. Now, we already know that Jason and Charles are not twins (I think we were told Charles is 18 months older than Jason?). We also know that Kenneth De Laurentis is NOT Jason's dad. So Charles and Jason only share a mother, not a father. Soooo, here's my thinking - maybe Rhys isn't Charles, but he is still related to Jason - not through Jessica De Laurentis, but through Peter Hastings? Yep, I predict that he's another Hastings lovechild! I'm genuinely struggling to come up with a list of Charles/A suspects here. My main one for ages has been Wren - purely because he's the right age, and he's one of the few male characters who hasn't been directly in the A frame yet. Although as my friend Lynsey pointed out in one of her recent PLL reviews, Wren wouldn't really make sense as he worked at Radley, and Charles was a patient there, so surely he couldn't be one and the same person. If it's not Wren though then who the hell is it?? I'm trying to rack my brains to think of male characters we've been introduced to who it could be. It surely can't be Toby or Ezra as they've been red herrings before, and logistically they can't have been in the dollhouse as we saw them searching for the girls. Same goes for Jason, who I also suspected for a while, as after the arcade meet up that crossed him off my list. A bit of a left-field one here - but what about Melissa's flatmate in London who took Spencer out on a date? I can't even remember his name, but he's about the right age too, and looks like he could be a relative of Jasons. Although in saying that he also looks like he could be a relative of Andrew's. The only other option I can think of is that he's someone we haven't met before, but that would be a bit of a disappointment wouldn't it? Or it could be someone who we think is dead (Wilden? That other police officer whose body was found on the train? Ian?). Ahhh I just want to knooooow!! Potentially as interesting as the "who is A/Charles" reveal, is finding out who is currently in the "A Team". There surely must be some shockers here - my money is on Toby or Ezra. I also think Mona is still involved, and Jenna, and also Sarah. Oh and Melissa. What Else Will We Find Out? If we're apparently finding out EVERYTHING about what happened that night then we should get the answer to some unanswered questions, like who hit Bethany. I think there's going to be some sort of big reveal about the girls being involved. From rewatching a couple of episodes there's little hints that there are secrets about that night that we don't know - e.g. Aria telling Emily "we know she's dead right?" in the first episode, or Ali telling Hannah when she visits her in the hospital (in what we initially think is a dream sequence) that they remember more about that night than they think. Maybe Spencer *did* hit her after all, thinking she was Ali and the other girls helped cover it up (I know Melissa buried her, but maybe the girls came back to take care of it to find the body gone and then just assumed it didn't actually happen). The episodes I rewatched reminded me of Spencer's instability - like ending up in Radley or becoming addicted to those pills - which makes me think that maybe there's more to her past than we think. Another big reveal will surely be what happened to Toby's mum, and I reckon there must be some tie up with Charles and Bethany. Maybe Charles was the one who pushed her off the roof, although I don't know why. This is one storyline where I'm a bit lost as to the timeline and the connections between the characters - maybe Charles and Bethany were a couple, Jessica didn't approve? I don't know where Toby's mum comes into this, but I really hope we get some answers. I'm planning on getting up early on Wednesday morning so I can watch the episode before going to work (don't judge me ok), because I really don't want to risk seeing any spoilers. I saw something online though that said the episodes tend to go up at 8am which isn't ideal - maybe they'll put it up earlier as it's a special episode?? Fingers crossed anyway. If you're a PLL fan let me know your finale predictions below! The wait is almost over guys, we can do this.